WASHINGTON (March 08, 2011) -- It's not likely what's being cooked up at Fort Lee, Va., will ever show up on the menu in a dining facility downrange, but the Soldiers manning the skillets there will go, and when they do, they'll take with them the skills they've demonstrated here. "There's probably not a lot of pate a choux being served in Afghanistan right now, except for maybe around -- they probably do some decorating around Christmas or Thanksgiving," said Chief Warrant Officer Russell D. Campbell, show chair for the 36th Annual Culinary Arts Competition, here. Spc. Oscar Alvardo, stationed out of Wheeler Army Airfield, Hawaii, won a gold medal for the Hawaii team in the junior chef of the year competition that was part of the 36th Annual Culinary Arts Competition, March 3-9, at Fort Lee, Va.
"But the competencies these chefs and servicemembers train for and prepare for to come here do correlate directly to the service they provide to their servicemembers if they are in Iraq and Afghanistan. It builds their pride in their profession, and helps their skills and creativity," Campbell said. The 36th Annual Culinary Arts Competition, March 3-9, at Fort Lee, Va., pits military food service professionals against themselves and each other to show off their best cooking skills. Inside the field house here where the competition was held, two mobile Army containerized kitchens -- stainless steel boxes, like trailer homes outfitted with everything needed to cook hot meals for an Army in the field -- stood against one wall. In one of the two kitchens, a team of Soldiers assigned to the 2nd Infantry Division, Korea, prepared an Asian-themed meal featuring a Thai-style sweet and spicy seafood soup, chicken adobo with citrus rice and brunoise vegetables and a desert featuring a chocolate tort and a pomegranate and lime mousse. About 30 feet away, in the second containerized kitchen, Soldiers from other units in Korea -- part of the U.S. Force Korea team -- prepared a meal featuring items like a seafood bisque with shrimp and scallops, an apple forcemeat stuffed pork loin, potato gnocchi, sauteed green beans wrapped in prosciutto, and a desert with bread pudding, bananas foster and a peanut butter mousse. The two teams each had four hours to prepare from scratch meals for 80 real, paying customers, as part of the field competition. Spectators of the competition were allowed to purchase meal tickets to serve as customers in the "restaurant" that built in front of the mobile kitchens. Sgt. Brian Baker, 557th Military Police company, Camp Humphreys, Korea, was one of the military chefs competing as part of the USFK team. He was responsible for preparing the team's entree, the pork loin. He said timing was the most difficult thing for him in this part of the competition. "It was 80 servings of pork loin, and I couldn't do any prep for that," he said. "I had to fabricate my proteins here on site. I had to trim off the fat and stuff I didn't want to use, remove some to make my forcemeat, butterfly it out and pound them out, and line them with spinach." Baker piped the "forcemeat," a paste of pork trimming and apple, onto the pork loin and spinach and then rolled them up and tied them with a string in preparation for browning and baking in the mobile kitchen. Spc. Jarvis Elliott, assigned to Camp Henry, Daegu, was responsible for preparation of the gnocchi part of the team's meal; something that took about two hours. He said he's been cooking "since I was five years old on my daddy's knee." "I could have chosen any job I wanted and this is the one I wanted," said Elliott, about his choice to be an Army cook. Preparing to participate in the culinary competition at Fort Lee was a lot of work, he said. "It took a lot of practice and a lot of mental prep," he said. "They talk about athletes imagining themselves winning. Well, we do the same things. We go through the same dish again and again and again. You write down your time lines you make sure you know what you're going to do, step-by-step and make sure it happens." During the competition, the power in the USFK kitchen went out, through no fault of their own, "but we adjusted best we could and kept trucking. We were able to pull it out," Baker said. Nevertheless, the team came away from the completion with a silver medal. Their competitors, from the 2nd Infantry Division, took a gold. Staff Sgt. Jeffrey Blanchette, the team manager for the 2nd Infantry Division team, said teamwork is critical to their success in the field competition and anything the team does at the Culinary Arts Competition. "If you have a great team, no matter what equipment you're cooking on, you can do well," Blanchette said. There were plenty of individual successes at Fort Lee as well. Spc. 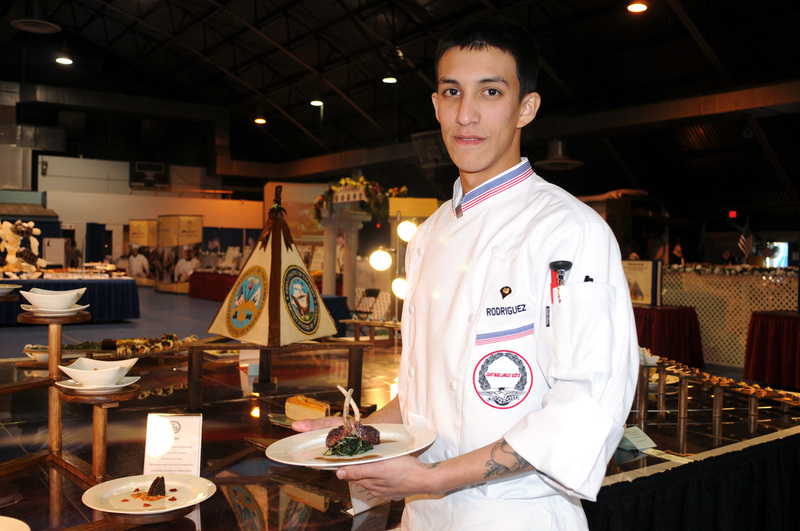 Oscar Alvardo, out of Wheeler Army Airfield, Hawaii, won a gold medal for the Hawaii team in the junior chef of the year competition. He's been in the Army for five years now and this was his first time cooking competitively. Spc. 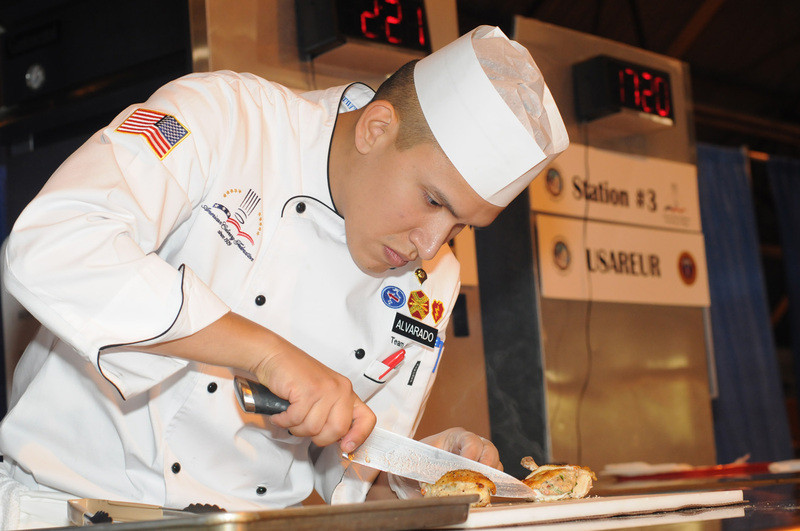 Bennett Rodriguez, stationed at Fort Story, Va., earned a bronze medal for his team as part of the team buffet portion of the 36th Annual Culinary Arts Competition, March 3-9, at Fort Lee, Va.
"Everything just came out perfect," he said. "I've been practicing for the last two months every day, non-stop. And it paid off in the end. It took me a long time to figure out my order. I've done it so many times. This last perfect order, this is the third time I've tried it. I was kind of hesitant, but I still went through with it and it came out all on time." Alvardo is from Allentown, Pa., where he was born and raised. Being stationed in Hawaii, he hasn't seen his family in some time, so they showed up at the competition to watch. "This is the first time they've seen me cook," he said. Included in the entourage, his mother and his grandmother, whom he credits for giving him some of his passion for being in the kitchen. "She would also cook, and I would watch," he said. "I love cooking and making the food look nice and taste as good as it looks." Alvardo's deployed to Iraq twice in his Army career. Pvt. Chelsea Karr, stationed in Bamburg, Germany, competed against Alvarado in the junior chef of the year competition. Though she's only been cooking in the Army for less than a year now, as she only enlisted in June 2010, she took home a bronze medal for the U.S. Army Europe team. She said she's had some cooking experience prior to the Army, but nothing compared to what she's seen going on at the food competition. "This is high class," Karr said. For her entry in the competition, she prepared grilled salmon and parsnip puree on a bed of broccoli and mushroom salad. "The timing is really ... you have to organize your timing," she said. "And keeping your station clean. And keeping your food hot -- that's what the judges are also looking for. If it's cold, it's not good." Karr followed her father into the Army, who enlisted just a year prior to her. Soon, she said, in December, her unit will deploy -- she thinks to Afghanistan, though now she said the details are changing. She said the gourmet cooking she does in the competition won't be seen while deployed, but the skills she uses will be. "This is gourmet cooking -- at the (dining facility), we just prepare and serve. We don't make the plates all special. But every skill is just as important: time, organization, and cuts, for instance," she said. At the center of the competition: the cold food displays -- probably the most time-intensive, detail-oriented part of the competition. Each table represents about 24 hours worth of non-stop work on the part of each team. They are a theme-oriented displays of such things as hors d' oeuvres, appetizers, desserts, entrees, and buffet platters. Nearly every piece of food on the table looks like a tiny, glazed piece of artwork. It "represents their skills and abilities to present an artistic display of food, their development of menus, compositions, deserts, even their detail they do in their petit four work," said Sgt. Maj. Mark Warren, Joint Culinary Center of Excellence. "This is one of the best examples of paying attention to details." Spc. Sarah Deckert, of the Army Executive Dining Facility at the Pentagon, won a gold medal for her part of her team's display. "I tried to utilize as many cuts of pork as I could," she said. "The centerpiece is a roasted loin, mushroom-wrapped. The showstopper piece -- it's a stuffed trotter." The trotter -- that was a pig's foot she deboned, removed the meat from, then re-stuffed like a sausage with spinach and forcemeat, before slicing, spicing and displaying on a platter. She also made something out of the sow's ear. "It's a braised pig's ear and pickled vegetable piece," she said. "Also head cheese -- you cook the whole head and utilize all the meat and the fat to make a terrine out of that." 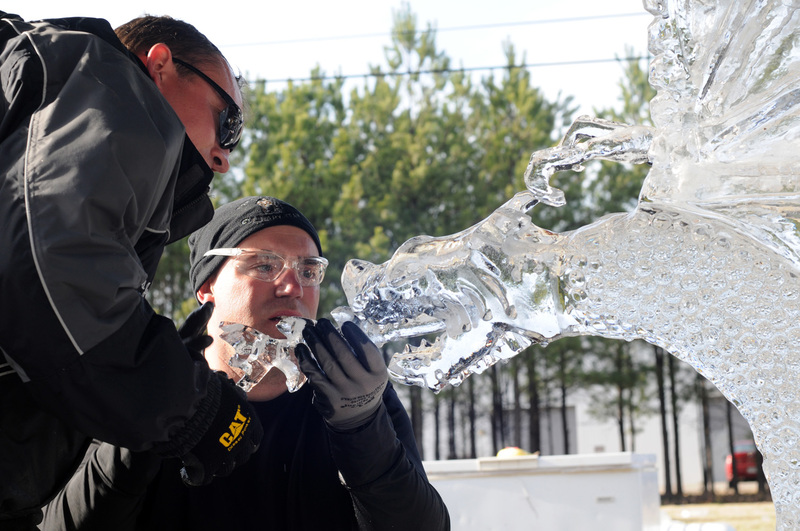 Chief Warrant Officer 3 Jeff Lein and his team from the U.S. Army Special Forces Command (Airborne), out of Fort Bragg, N.C. carved a dragon from a block of ice as part of the ice carving competition during the 36th Annual Culinary Arts Competition, March 3-9, at Fort Lee, Va.
Deckert actually cooks in the Pentagon, sometimes even for the secretary of the Army -- though she said the menu range for even his table doesn't include the likes of what she put out for the judges at Fort Lee." "We wish -- this is only stuff we get to do when we come to Fort Lee or compete," she said. "But I might throw a trotter at him some day. Deckert's been in the Army for a year now. Prior to that she had earned a culinary degree and a bachelor's degree in food service management. She's worked in the food service industry since she was 15 years old. Deckert's teammate, Staff Sgt. Michael Bogle, also assigned to the Army Executive Dining Facility at the Pentagon, earned a silver medal for his contribution to his team's table. His platter featured five tiny dessert items -- small cakes and pastries -- all under the team's "farm to table" theme. "We used ingredients from around Virginia, Washington, D.C., and Maryland," he said. "This is actually a Maryland Smith Island cake, done to a small scale." The tiny cake pieces, all six of them, were arranged on a granite slab along with four other types of dessert pieces Bogle had created -- a total of about 30 pieces in all, each meant to be consumed in about one bite, he said. "Just this one, from start to finish, about five hours," he said. "You have to make sure the cuts are exactly the same -- the same height and width. You have to make sure the sugar is the same." The knife has to be hot to ensure the icing doesn't smear down the pieces and mess up the layers, he said, and "if the cake gets soft, you put it in the fridge." To make the same tiny pieces of cake for customers in a restaurant, in a production environment, instead of in a competition environment? "I could have done this cake for 200 in an hour," Bogle said, also noting "this wasn't one of the most difficult pieces on this tray of five." Outside the field house, blocks of ice arrived on a truck to be turned into ice sculptures through the application of chainsaws, ice picks and blow torches, by the likes of Chief Warrant Officer 3 Jeff Lein and his team from the U.S. Army Special Forces Command (Airborne), out of Fort Bragg, N.C.
"You have got to design a piece that is complicated, use the entire block of ice, and have very limited left over ice," said Lein, on his strategy for doing a medal-winning design. "That's what the judges look for. And we do a lot of fuses -- melt a piece of ice and fuse it together at different angles." His team built a dragon using that technique. He said the piece was something he wouldn't do for a buffet, however, because "it's too dangerous." Illustrating that point: just seconds after the judges turned their back on his piece, the head crashed to the ground -- then the tail piece. But it was too late. His team already won a gold medal for their single-block ice carving. The culinary arts competition showcases the talents of military chefs from all branches of the U.S. armed forces, and includes the most junior servicemembers in the culinary arts profession, such as those with less than one year of service to those with as much as 20 years experience. This year, more than 20 teams, composed of 248 individual competitors, competed in more than 638 different individual or team competitions. "It continues to build on their profession and what they know, and there's a lot of pride in the competition," Campbell said. "They can go back to their friends and family and leadership and show what skills they had they didn't know they had or maybe their leadership didn't know. And we do a lot of training here as well."